Part of Computer Associates’ Unicenter TNG system management suite, ControlIT 5.0 Advanced Edition is a remote control program for Win2K and NT. The application enables Web-based control through its Web Viewer; this is installed when you select to install ControlIT Viewers. Web Viewer is installed in the same directory as other ControlIT programs, with a shortcut created in the Start Menu. The ControlIT setup program doesn’t add Web Viewer to a Web server so that users may access it via any Web browser. Instead, Web Viewer, though it utilizes a browser as its operating environment, requires that the ControlIT Viewers be installed on any workstation you wish to use. This may be due to licensing requirements but it makes Web Viewer rather pointless, as the regular ControlIT Viewer, which also is installed, offers more functionality. 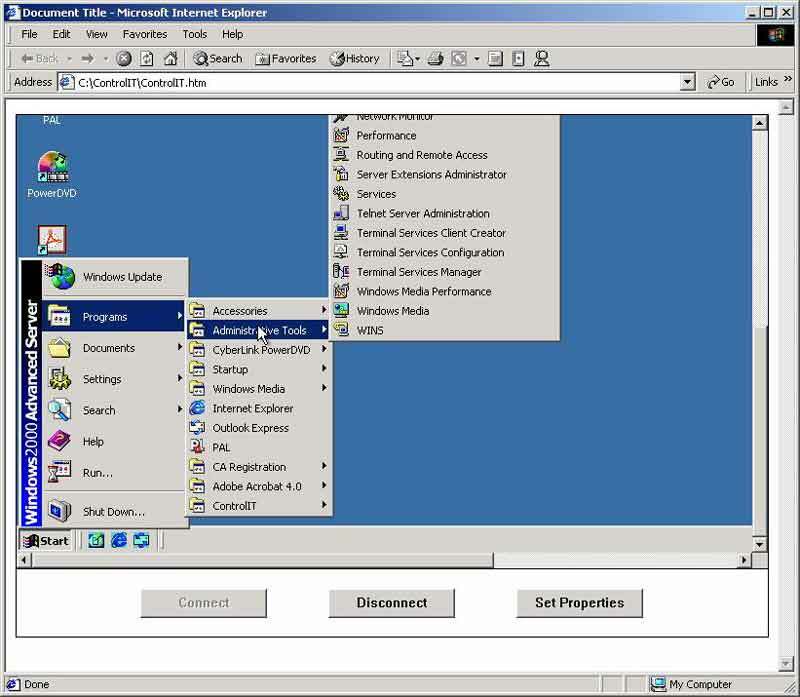 Once it’s executed, Web Viewer lets you connect to a system running the ControlIT Host software, which is installed at the same time as the viewer software. The user specifies the system’s host name, IP address, and username and password to access ControlIT. Note that this is a ControlIT username/password and not a Win2K username/password. Users can perform configuration via the ControlIT Management GUI with the ControlIT Host software, and ControlIT will synchronize its users with your server’s user accounts or domain user accounts. ControlIT also lets you encrypt traffic between view and host at up to 128-bit key strength. I did encounter one problem with Web Viewer. If you aren’t logged onto the server you intend to manage with the viewer, the application doesn’t let you activate the Windows logon via the Ctrl-Alt-Del command, making it impossible for you to log onto the system. In addition, Web Viewer is not a separate session from the console, meaning any mouse movements are made both in Web Viewer and on the server console. The remote control session offered by ControlIT allows you to access any installed program on your system, enabling you to manage Windows and third-party software and features. Still, Web Viewer needs some work before it can be considered a true Web-based remote management system. But don’t count this product out. Despite some sticking points, ControlIT’s features and interoperability deserve a close look, especially if you use Unicenter applications.